ãIntelligentes Walkie TalkieãArmor 3T also is a revolutionary mobile phone with interchangeably intercom, which supports 1W/2W hardware intercom (400-470MHz).It means that supporting automatically record, earphone intercom with the range up to 5 km did not rely on any software. At the same time,detachable antenna installed on the rugged cell phone to make you use it more convenient. ãMilitary MIL-STD-810G CertifiedãHighest IP68/IP69K rating, it can handle 2 hours of immersion in 2 meters of water, or 24 hours of submission in 1 meter of concrete. Fitting the temperature ranges from -4Â°F (-20Â°C) to 140Â°FC (60Â°) , this rugged cell phone could work in all geographical environments. With water-resistance, dust-resistance, shock-resistance, Armor 3T will protect himself all round and then standby your side to support you. ã5.7-inch Screen + 18:9 FHD Display + Corning Gorilla 5ãWith a 5.7″ 18:9 all-screen design and 2160 x 1080 FHD+ resolution, plus a scratch resistance Corning Gorilla 5 Glass, Armor 3 would show more content and bring you an immersive visual experience, and no worry about any unexpected damage. ã10300 mAh Battery and PE+ 9V/2.0 Fast ChargeãUltra long-life battery for tons of screen-time on a single charge and ultra power saving mode to extend your charge even longer. With advanced PE+2.0 and 9V/2A fast charging technology (18W, Reverse charger supported), a full charge will only need a sanp time.Keeping you power on all the time. 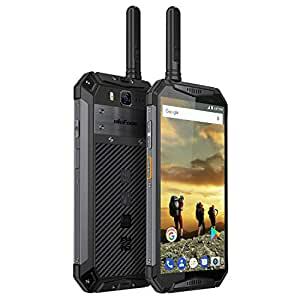 ãGlabale Frequency BandãCompared with other outdoor smartphonesï¼The advantage of Armor 3 is it has 35 network bands in 6 types around the world, covering major network providers in Asia, Europe and the Americas. Support dual Sim Dual Standby with 4G network.